We embarked on a journey not knowing what we’d find. Like explorers, our expectations were challenged at every turn and we each faced personal and common battles. The first two weeks in Japan seemed comfortable, despite the cell-like accomodation in Tokyo and a rural home stay with friendly strangers who don’t speak English. The four weeks that followed were spent on board a ship called the Nippon Maru. It had 8 floors, however two of which were strictly off limits. I harshly learned “rules are NOT made to be broken” and that the admin army on board rule with an iron fist. That however was not the greatest lesson, nor even mattered when I fell incredibly ill three weeks into the program. Being so sick with flu, infection and cough during the leg from Singapore to India, then Sri Lanka back to Singapore, I realised I took my health for granted. When I was finally well (a trip to Singapore hospital and over 15 prescribed medicines later) I tried to make up for lost time by spreading myself across all events and conversations. The ship became my mental playground, as I was able to strengthen my confidence and public speaking ability each time I grabbed a mic. There were countless opportunities to share ideas and network, which I am most grateful for. The one-on-ones, the group laughs and “in” jokes based on performances and personal traits did it for me. They, or should I say, the people who openly shared themselves with me were the champions of the program. I love how humans have the ability to forget pain and negative emotion, or flip it around to create positive memories once all is said and done. I was frustrated. I was challenged and at times I felt defeated over the 6 weeks. But now, months later, I can smile, laugh even, about all of it. Because it’s totally me. We are all responsible for the journey, the expectations, the frustrations and the fun. This was my SWY story….But what about the other 240 participants? Here’s a small selection of personal stories from some of the other inspirational souls who participated in the SWY30 program, funded and coordinated by the Japanese government annually. Meet Buntu Majaja, age 25 (he thinks). Buntu saw snow for the first time during his home stay in Japan, thanks to the Ship for World Youth program. During Port of Calls in India and Sri Lanka he created other memorable moments, such as visiting a “temple-business school” and observing thousands of youth engaged in community work. As a result of the program, Buntu realised he must create his own life path, rather than let others determine what’s important. He believes accolades or possessions are just stepping stones to something greater. Buntu is thankful for what he’s learned in the past and looks forward to “designing the life [he] wants to live” from now into the future. To be “fully blessed by the SWY experience,” Buntu felt he needed to let go of his expectations; that he had to forget the way he was used to doing things back home in South Africa. When he did, he learned new things about himself and deeply valued the genuine conversations and friendships he developed. When Buntu joined the program his main aim was to explore new business opportunities. Upon returning to South Africa, he returned to the path he was on; only now he has the support of an ever-growing SWY family. Buntu said he can only sum up the SWY program with “domo arigato gozaimasu”. This is a small part of Buntu’s SWY Story. Meet Noemi Del Castillo, age 26. “I actually couldn’t believe I’d been selected,” says Noemi, “I thought the program was meant for people involved in politics or international relations.” Noemi is an inspirational music teacher from Mexico. She describes her SWY experience as “surreal” right from the beginning. One of Noemi’s biggest take-aways from the program was learning everyone can be a leader, and not all leaders are the same. She believes sometimes all it takes is one person to listen, care and truly believe in a person to unlock their potential. How great is it to think we can give someone that gift?! In the future Noemi wants to create an association that provides free medical services to children with disabilities, while also promoting different cultures through free music lessons. She’s equality interested in studying and teaching music therapy. She hopes to gain government support and recruit volunteers with an interest in music and/or working with children who have special needs. Noemi will continue to share her moving personal story and musical talent throughout the world; no doubt spreading happiness and joy to other people, and inspiring children and youth to go for their dreams and fight for what they believe in. This is a small part of Noemi’s SWY Story. Meet Marcos Sozinho Nicangala, 25 years old. Marcos wrote himself a clear set of goals before he left his home country, Mozambique, to join the SWY program; he wanted to learn about the culture of other global participants and build everlasting friendships; to develop a deep understanding of how to make the world a better place; and to inspire others by sharing his unique life experience and dreams. 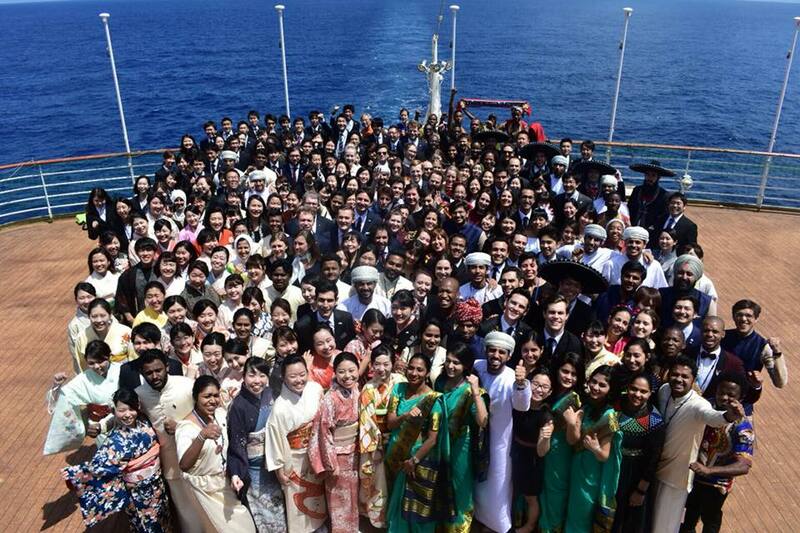 Marcos celebrated his 25th birthday on board the Nippon Maru. That morning during assembly over 240 participants sung him Happy Birthday. The surprise arranged by his letter group made him so happy, he says his eyes welled up with tears of joy. “They spoiled me all day long and wrote me touching messages,” recalls Marcos, “I really loved it.” He attributes his increased self-confidence to the unconditional love and respect everyone in his letter group showed. Marcos says hearing words of encouragement helped him believe in himself and realise he is a skilled presenter. “I have a dream…,” says Marcos, “…a dream to build schools so that orphans and vulnerable children have access to a good education.” He explains many children in rural areas cannot go to school. “In most cases, these children don’t go to school because their caregivers cannot afford to buy uniforms, bags and other school materials.” Marcos dreams of building schools with dormitories so students can receive the food and sleep they need to concentrate in class. This is a small part of Marcos’ SWY Story. She’s an inspirational 23-year-old Japanese woman. She participated in the SWY30 program because she wanted to network with young professionals who “aspire to create a better world”. One of her favourite moments during the program was giving “one of the best speeches in [her] life” in front of the 244 participants on board the ship. She explained whilst in the moment she trusted the words she spoke, rather than what she’d prepared on paper. The experience helped her become more sure of herself and her vision for the future. Haru plans to enrol in a Master’s program to study Entrepreneurship so she can create innovative services that grow and circulate compassion throughout the world. This is a small part of Haru’s SWY Story. Meet Beatriz Jiménez López, age 21. “I could only be certain of three things when I signed up to participate in the SWY program; it would be a cultural exchange; we would be at sea; and the goal was to create a new generation of leaders. I never expected it to impact me the way it did. The people I met reminded me there’s a whole world of other thoughts and opinions out there, which is something I think we often forget; it’s easy to get caught up thinking your way is the right way; despite differences of opinion, background and birthplace, we all managed to find commonalities between us and offer something to each other. We shared our skills, compassion and goals to make the experience enjoyable and meaningful for all. As I’m in the process of completing a degree in Translation and Interpreting, I’m still trying to figure out my role in the world and how I can develop into the leader I want to become. I think I’d like to provide translation/interpretation services for disadvantaged groups within society, such as people being trialled in the criminal court. This service would ensure they can clearly express themselves using their native language and fully understand what’s happening. This is a small part of Beatriz’s SWY Story. Meet Keith Honwin, age 20. During the SWY program Keith learned a lot about himself and developed a love for writing poetry. He took great pride in sharing his work with others to help them learn and grow. While living in Mozambique, Keith will create a language program called YEP; an idea he and peers came up with during the program. Overall, he aims to empower young people to make their dreams come true and achieve global unity. This is a small part of Keith’s SWY Story.